Ansonia Clock Co. Royal Bonn, "No. 503", C. early 1900\'s. No name on the back, just the firing marks imprinted by the case makers. It is numbered because no catalog shows this clock. When Mr. Ly was preparing his Ansonia book he assigned numbers to those clocks that had no name, hence the numbering system. This Royal Bonn case is pretty large at 14" high, 11" wide. No breaks, repairs, chips, or what have you, just the usual hairlines we see in most porcelain cases. 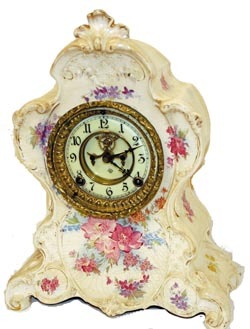 The case is predominately cream colored with pink and purple flowers and a small amount of gold highlight. 2 piece porcelain dial is very nice, open escapement, original hands, good beveled glass, original back cover. Correct pendulum, but new from Timesavers. 8 day movement strikes half hour and hours on a gong. Ly-Ansonia #2669.